One morning, as I was walking through the west Guatemalan town of Mazentanango, I discovered many local farmers who had come to town for the day with produce for sale. 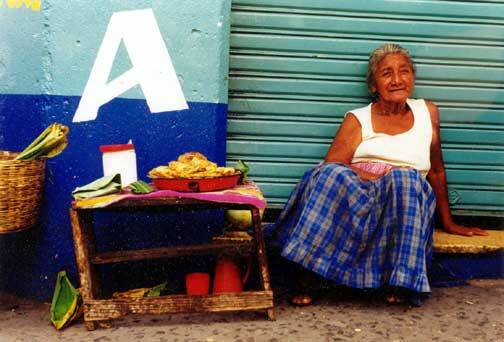 This woman with her sparse offerings was sitting in a shaded alleyway waiting for her clientele to arrive. I asked if I could take her photo, she consented and I then contributed to her profit for the day. Smiling all the while, I imagined her content to wait out the hot summer day on her concrete sales stoop.